Overcrowding leading to poor sanitary conditions in IDPs camps and communities contributes to further cholera outbreak in Borno Nigeria. MAIDUGURI, Nigeria, Nov 12 2018 (IPS) - The number of people who have been affected by cholera in northeast Nigeria has increased to 10,000. The disease is spreading quickly in congested displacement camps with limited access to proper sanitation facilities. One of the major causes of the outbreak is the congestion in the camps that makes it difficult to provide adequate water, sanitation and hygiene services. The rainy season has also worsened the conditions. If more land is not urgently provided for camp decongestion and construction of health and sanitation facilities, Nigeria is steering towards yet another cholera outbreak in 2019. 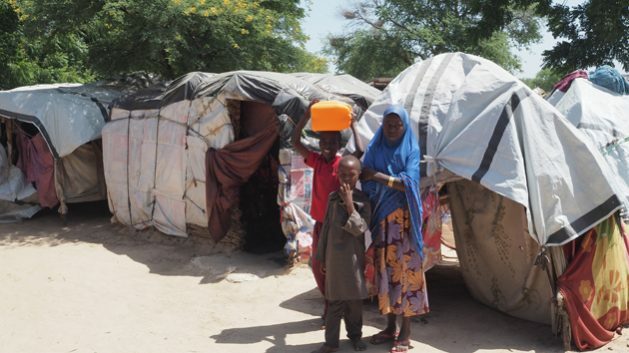 Maiduguri has the highest concentration of displaced people, with 243,000 displaced people cramped in camps, camp-like settlements and already crowded host communities, according to figures from the International Organization for Migration. In Kagoni Sangaya displacement camp, the eight latrines that were built to cater for about 150 displaced people are now being shared by 500 people. Camp residents said they end up defecating in the open which causes cholera and other water borne diseases in the area. We are calling on the authorities to provide more space in camps and host communities for the construction of new water and sanitation facilities, and for the international community to provide the necessary funding. Only this way can we prevent new cholera outbreaks. NRC has responded to the cholera outbreak by transporting at least 180,000 liters of clean water daily from Maiduguri to communities around Tungushe and Konduga towns, constructing more latrines where there are space and by sharing information about hygiene and cholera prevention with affected communities. – By 7th November, the cholera outbreak in northeast Nigeria includes 1762 registered cases and 61 deaths in Yobe State, 2737 registered cases and 41 deaths in Adamawa State, and 5845 and 73 deathsin Borno State, according to figures from the World Health Organization and the Government of Nigeria. – An estimated 7.7 million people in the three most affected states of Borno, Adamawa and Yobe now depend on humanitarian assistance for their survival. – NRC is currently providing life-saving assistance including food and livelihood support to help stabilize the living conditions of over 130,000 families displaced from their homes in northeast Nigeria. – In 2018, NRC provided water, sanitation and hygiene services to over 56,000 people in Borno state. – The humanitarian response plan for Nigeria is only 55% funded.